Some may say that technical analysis is 'bunk' but it's just that which caused me to short AMZN. Now you can say they're #1 when it comes to online sales but my question is, has their growth hit a plateau? Trading at 170x p/e, anything is possible. (click chart to enlarge). Talk is that MSFT is bringing the smart home to Windows. The feature will allow Cortana to be summoned on any Windows 10 PC lock screen. It's expected to appear in Win 10 updates starting in 2017 and this software-only feature could trump AMZN Echo and GOOG Home due to the obvious convenience of screen access. From an investor point of view, I would definitely take some off the table at this point and invest it in banks, industrials and insurers. But let's take a look at sales. No growth in 2016? Now that's interesting. With “Black Friday” here, the performance of retailers will be a focus for the markets. As of today, which retailers in the S&P 500 are projected to see the highest and lowest year-over-year earnings growth for the fourth quarter? Which retailers in the index have seen the largest upward and downward revisions to earnings estimates for Q4 over the past two months? 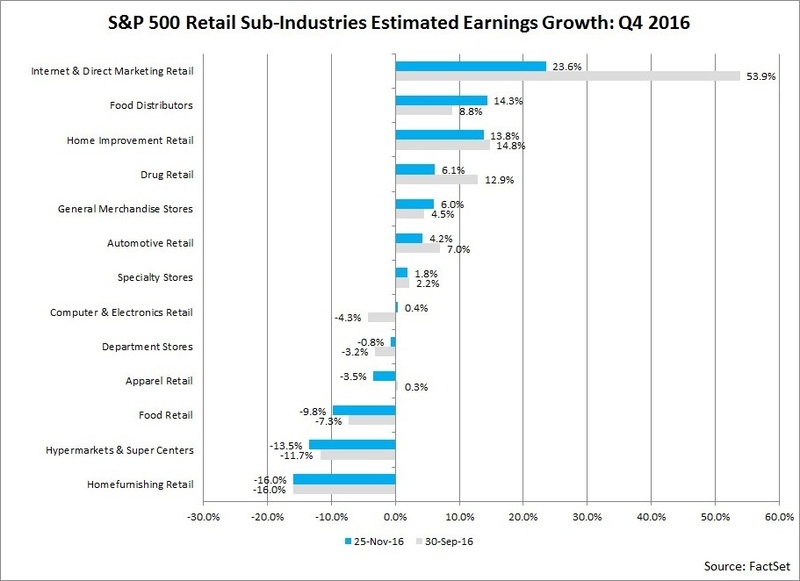 In terms of year-over-year earnings growth, seven of the 13 retail sub-industries in the S&P 500 are predicted to report growth in earnings for the fourth quarter, led by the Internet & Direct Marketing Retail (23.6%), Food Distributors (14.3%), and Home Improvement Retail (13.8%) sub-industries. On the other hand, six of the 13 retail sub-industries in the S&P 500 are predicted to report declines in earnings, led by the Home Furnishing Retail (-16.0%), Hypermarkets & Super Centers (-13.5%), and Food Retail (-9.8%) sub-industries. As Americans spend more money on doing things, not buying things, department stores are losing out. A rebound in overall spending at retailers, which grew 0.6 percent in July from the previous month, has eluded department stores, where sales dropped 0.8 percent. Step aside Sears and Roebuck catalog. 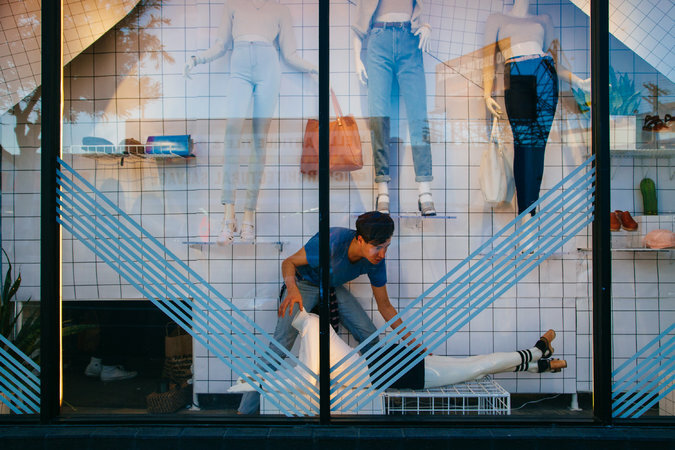 As if brick and mortar wasn't already struggling against online shopping, EBay Inc is launching virtual stores called "shoppable windows" this month that the e-commerce company hopes will help retailers generate more sales from their existing physical store networks. The screens, which have been Beta tested in San Jose the last few months, will now be expanded to four locations in NYC according to an eBay blog.